Welcome to my homepage. I am an astrobiologist, currently working at The Carl Sagan Institute at Cornell University, New York. My path into astrobiology took many twists and turns, meandering from physics to environmental biology and finally to astronomy. My interests lie firmly at the intersection between astronomy, biology and geophysics, which is a perfect place from which to explore questions about how life would influence exoplanet atmospheres, climates, appearances and detectable biosignatures. This involves combining information about a planet's size, mass, location and potential atmospheric composition, with details about its host star, while also exploring the physical and evolutionary limits of biology under the environmental conditions that could exist on a given planet. The results of work like this not only help us to determine how to search for life on distant alien worlds, but can also help us to build on our understanding of the complex interplay between the atmosphere, geosphere and biosphere here on Earth. This connection between other worlds and our own is the driving force behind my work. My research so far has encompassed everything from exploring exotic forms of photosynthesis on planets with two suns, to investigating the types of biospheres that could thrive on UV-irradiated worlds, and even looking at where the last puddle on Earth may be in the far-future and what this would mean for the search for life in the Universe. Astrobiology is a science concerned with the search for life beyond Earth, as well as the origins, limits and future of life in the Universe. It is truly interdisciplinary in scope, encompassing astronomy, biology, chemistry, geophysics and many other disciplines. In my role I work as a bridge between astronomy and biology. My research focuses on using Earth as a template for exploring how life would interact with the atmospheres and surfaces of habitable exoplanets. This involves using Earth-like ecosystems as a basis for envisioning possible extraterrestrial biospheres by finding the overlaps between the environments life has adapted to on Earth (or to which evolutionary biology suggests that life could adapt given the right 'push') and the environments we predict for potentially habitable exoplanets. I then use these alien-but-familiar biospheres as components of climate or photochemistry models to simulate how less Earth-like life might be remotely detectable on specific, or hypothetical, exoplanets. One aspect of this involves studying the impact stellar evolution may have on the biospheres of planets in the habitable zone of their star (the region around a star where temperatures are just right for liquid water to exist). These impacts include how life would adapt to changing conditions over geological time, how remotely detectable biosignatures would change and, ultimately, when all life on a planet would come to an end. Another aspect of my research involves investigating how frequently-flaring, active red dwarf stars would affect the biologically harmful ultraviolet radiation fluxes on any closely orbiting habitable zone rocky planets, as well as the mechanisms life could employ to survive such harsh environments. It is important to know how the signs of life change over a planet’s habitable lifetime, or how they could differ for the full range of possible habitable environments that could exist on rocky exoplanets. Near-future habitable exoplanet discoveries will not all be similar to the present-day Earth. Some may host younger, simpler biospheres, others may host older, dying biospheres, while others may host more alien biospheres, hardened to high radiation levels, or other extremes. Different subsets of the distribution of possible habitable environments could lead to life that is very different to the life we see on Earth today. Consequently, these scenarios will produce very different sets of biosignatures. Knowing what signatures to look for from these worlds will increase the chances of confirming the presence of life on a planet beyond our solar system. These types of project require the blending together of knowledge from a wide range of fields, such as stellar evolution, planetary geophysics, atmospheric physics, biological evolution, environmental biology and ecology. Putting strands of different science together in this way to imagine alien worlds leads to new and novel ideas, as well as some very interesting collaborations. Perhaps even more importantly, it can give us new perspectives on our own planet and the fragile interplay of life, geosphere and atmosphere that makes it not just habitable, but home. As well as working within the The Carl Sagan Institute my work involves collaborations based at the University of St Andrews with the UK Centre for Astrobiology at the University of Edinburgh and the James Hutton Institute at the University of Dundee. I am also a committee member of the Astrobiology Society of Britain. Outside of work I enjoy travelling, wine-making, baking, hiking and a healthy interest in dinosaurs! Biofluorescent Worlds: Global Biological Fluorescence as a Biosignature: O'Malley-James J.T., Kaltenegger L. (2018), MNRAS 481: 2487-2496. The Vegetation Red Edge Biosignature Through Time on Earth and Exoplanets: O'Malley-James J.T., Kaltenegger L. (2018), Astrobiology 18: In Press. UV Surface Habitability of the TRAPPIST-1 System: O'Malley-James J.T., Kaltenegger L. (2017), MNRAS Lett. 469: L26-L30. Habitability: A Review: Cockell C.S., Bush T., Bryce C., Direito S., Fox-Powell M., Harrison J.P., Lammer H., Landenmark H., Martin-Torres J., Nicholson N., Noack L., O'Malley-James J.T., Payler S.J., Rushby A., Samuels T., Schwendner P., Wadsworth J., Zorzano M.P. (2016), Astrobiology, 16: 89-117. Observational Signatures of Self-Destructive Civilisations: Stevens A., Forgan D. O'Malley-James J.T. (2015), Int. J. Astrobiology 15: 333-344. In Search of Future Earths: Assessing the possibility of finding Earth analogues in the later stages of their habitable lifetimes: O'Malley-James J.T., Greaves J.S., Cockell C.S., Raven J.A. (2015), Astrobiology 15: 400-411. Swansong Biospheres II: The final signs of life on terrestrial planets near the end of their habitable lifetimes: O'Malley-James J.T., Cockell C.S., Greaves J.S., Raven J.A. (2014), Int. J. Astrobiology 13: 229-243. Circumstellar Habitable Zones for Deep Biospheres: McMahon S., O'Malley-James J.T., Parnell J. (2013), Planetary & Space Science 85: 312-318. From Cytoplasm to Environment: The Inorganic Ingredients for the Origin of Life: Novoselov A.A., Serrano P., Pacheco M.L.A.F., Chaffin M.S., O'Malley-James J.T., Moreno S.C., Ribeiro F.B. (2013), Astrobiology 13: 294-302. Swansong Biospheres: Refuges for life and novel microbial biospheres on terrestrial planets near the end of their habitable lifetimes: O'Malley-James J.T., Greaves J.S., Raven J.A., Cockell C.S. (2013), Int. J. Astrobiology 12: 99-112. Life and Light: Exotic Photosynthesis in Binary and Multiple Star Systems: O'Malley-James J.T., Raven J.A., Cockell C.S., Greaves J.S. (2012), Astrobiology 12: 115-124. Swansong Biospheres: The biosignatures of inhabited earth-like planets nearing the end of their habitable lifetimes: O'Malley-James J.T., Greaves J.S., Raven J.A., Cockell C.S. (2014), Exploring the Formation and Evolution of Planetary Systems, Proceedings of the International Astronomical Union, IAU Symposium, Volume 299, pp. 378-379. 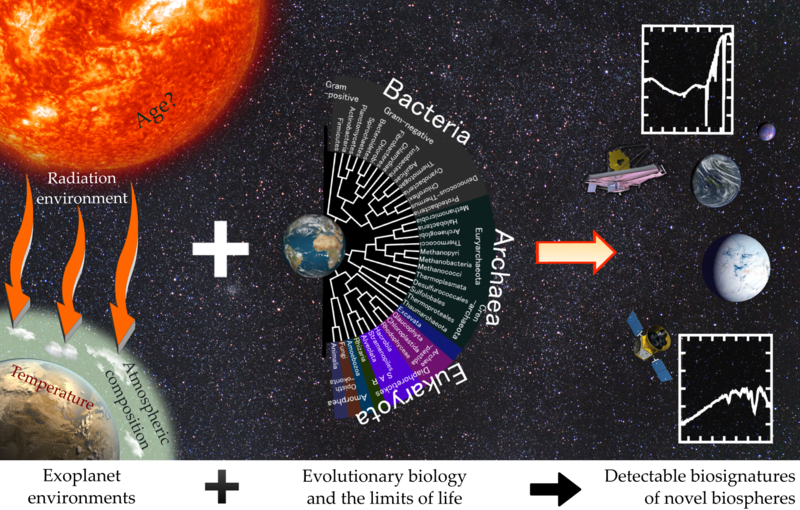 From Life to Exolife: The interdependence of astrobiology and evolutionary biology: O'Malley-James J.T., Lutz S. (2013) In: Evolutionary Biology: Exobiology and Evolutionary Mechanisms, ed. Pierre Pontarotti. Springer. pp. 95-108. Exotic Photosynthesis in Binary Star Systems: O'Malley-James J.T. (2011) - popular astronomy article for l'Astrofilo. In this section, press releases and news stories based on my work are summarised. I have also given a number of public talks at events such as the Fife Science Festival and the Kensington & Chelsea Celebration of Science on the topics of astrobiology, astronomy and other related themes. These talks are listed in the "Public Talks" section. In the "Educational Activities" section, my science outreach projects are described.